The workshop on Consumer laws was organized by the Centre for Excellence on Consumer Laws on 9 October 2017. The Workshop was divided into three sessions covering various aspects of E- Commerce, Misleading Advertisement and Medical Negligence. We had three distinguished guest speakers who graced the workshop. Dr. Pratima Narayan, Prof. Anita A. Patil and Dr. Venugopal B.S who spoke on E- Commerce, Misleading Advertisement and Medical Negligence respectively. The idea of the workshop was to create awareness among people and students regarding the consumer laws prevalent in the country. Dr. Pratima Narayan is an advocate and mediator. She has worked extensively in the area of consumer law, e- commerce and Intellectual property rights. She holds a doctorate from NLSIU, Bengaluru. Dr. Narayan has presented papers at various national and international seminars and conferences on e- commerce and consumer protection. The first session dealt with online transactions and consumer protection online. It was a very informative and interesting session. 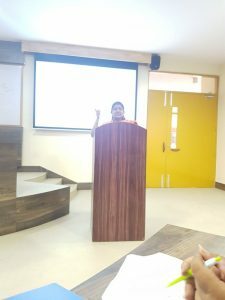 Ms. Anita A. Patil is an Asst. Professor NLSIU, Bangalore. She was awarded with two Gold Medals for securing 1st rank in specialization in Business and Trade laws, Masters of law 2012. The 2nd session dealt with Misleading Advertisement in India with special reference to Food, Drugs and Cosmetics. This session was a comparative analysis of the regulatory laws in UK, USA and India. A number of decided cases and certain cases pending before NCDRC was discussed. It was indeed a more comprehensive session on Misleading Advertisemt. Dr. Venugopal B.S, Principal IFIM Law College is a great academician. He has taught various subjects from Company law, Jurisprudence, Constitution to Criminal law, etc. He has taught in many colleges all across India. Has published many articles, presented papers in seminars and has administrative experience. The third and final session was on Medical Negligence where many aspects of medical laws, cases and instances was shared. Special focus was given to Consent under Medical Law. It was a very informative session. Dr. Pratima Narayan addressing the gathering. Prof. Anita. A. Patil delivering her lecture. The Workshop was open for all the students and faculties of IFIM Institutions. The registration fee for the Workshop was Rs. 100. We received a total number of 102 participants including Law, B.COM, BB.A and some faculties from UG College for the Workshop. IFIM Centre of Excellence on Consumer Laws works and deals with different aspects of consumer awareness, consumer laws and the rights and duties of one as a consumer. The Centre wants to create awareness amongst people by organising guest lectures, workshops, by visiting consumer forum, etc. This entry was posted in Featured and tagged IFIM Law School on October 13, 2017 by IFIM Institute.